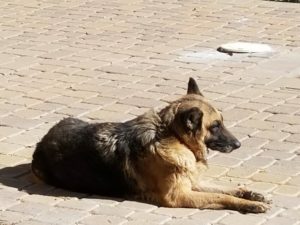 Lady’s story is one that we see far too often in the desert. This elder was found roaming around trying to find food with cactus needles stuck in her face. Skinny, tired and very fearful, she was one scared little Lady. 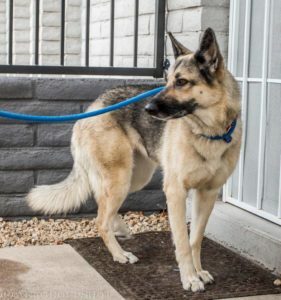 She really wanted nothing more out of life than to be with her people, have some yummy food to eat, and a cool, air-conditioned house to stay in. She loves to bask in the A/C after spending so long out in the hot desert. She is a demure, sweet girl, who has had a lot of turmoil in her past – we suspect a history of abuse, but that’s all over for her. She is living a great life now in her forever foster home! 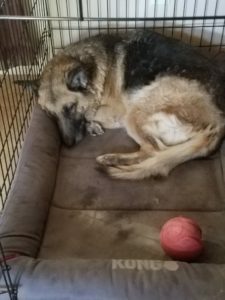 UPDATE 11-2018: We have a great update on our sweet older gal, Lady. She’s been living with her forever foster mom, Michelle L., for 18 months now. She used to hide in the dark bedroom, but now is much more alert, loves to bask in the sun, and even enjoys gentle play with her fur siblings. 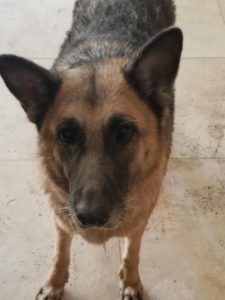 She also checks out what Michelle is working on the kitchen, and loves getting her treats. But best of all, she now loves attention and pets. It’s always amazing and inspiring to see how dogs blossom once their needs are met and they feel safe and loved. Thank you, Michelle, for opening your home to this lovely lady.